How about a smaller Stanley as a followup to the Likamobile? It's official: a 20HP Stanley Steamer kit from STW is not going to happen. I was quite prepared to stump up loadsamoney for a 20HP Stanley kit, but not quite that much. So that's that, no 20HP Stanley kit from STW. Pity, but understandable. But I'm not finished with this, yet. I grew up with steam, even though I've only just passed fifty. I've always said that I would trade my Triumph sports cars for a proper steam car. I've done the post-war classic car thing for a while now, it's time for a new challenge. 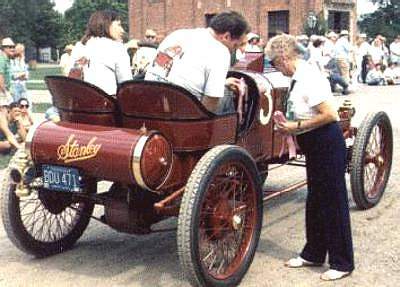 I'm sure there are other people like me, who would be interested in a true replica or re-creation of an early Stanley Steamer. So here's an idea: what about a kit for a small early Stanley, like a type A, B, C, BX or CX? If it is kept under 350kg empty weight (which should be possible with an original weight of 700-770 lb.) it may be able to pass a Single Vehicle Approval procedure for light quadricycles (EU vehicle classification L6e). There's no seat belt requirement and you can legally do 45km/h (28Mph). You'll still have to deal with all sorts of modern requirements like an electric horn and modern lighting to get it through the test, though, but it's doable in my view. All that can be taken off once it's on the road. 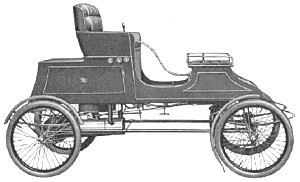 There would be advantages over both a Locomobile and a 20HP Stanley: four seats, for a start. 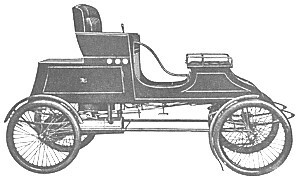 They are also more 'mature' steam cars than a Locomobile, but much smaller, lighter and easier to handle than a 20HP Stanley - and therefore much cheaper to produce. Best of both worlds, really. This could be a great follow-up to the Likamobile. The body is almost as simple, it seats four and it could have a 'wet', baffled engine inside the casing (ask Steve, he'll explain). 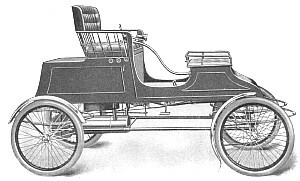 More reliable and needs less maintenance than earlier Locomobile/Stanley engines. Over the last few years Steve has learned how to engineer and build a Stanley and has made many new friends (not to mention potential new customers!) in the steam car world. (Reverse-)engineering a kit for an 8 HP Stanley should be a piece of cake for him now. ;)Besides, producing 'standard' Stanley parts like 8 HP engine castings, gears and steam and water automatics could open up a whole new market for STW. I would welcome four wheel brakes and other sensible improvements, like engine reinforcements and small fuel system modifications which are common on original cars. However, if at all possible from a cost perspective, I would urge STW to stick with the original boiler configuration and basic fuel system. In my personal view, especially the choice of burner on the Likamobile is rather cringe-worthy. Here you have a beautifully simple, original mechanical design that uses no electrics at all and it's ruined by putting in a battery, converter and electrically driven burner! The original Stanley configuration may be slightly more complicated to build and operate, but it's so much more rewarding to run. So what say you? I could try and buy an original small early Stanley Steamer, if I ever manage to find a good one at an affordable price. Or STW brings out a kit, so I can hand over my money to STW and assemble my own. I'm quite looking forward to that, to be honest. Not so much the handing over of money part, of course - but if it's less than twice the Likamobile and close to the original in concept and looks, I could well disregard the pain. As you know I am one of the future Lykamobile builders/owners, needless to say I am very excited to start this project. But, as expected my brain is now in overdrive dreaming of a future where I run to the grocery store in my steam car! Then I start thinking, I would like to have a bigger/faster steam car! and I do a bit of research and see what has been talked about and why the possibility of a 20hp will, most likely, never happen... unless you build a one off, which as I have come to see that it is very possible to do. Then after reading all I could about Stanley Steamers, I got the early Stanley coffin nose Steam bug, and I came across this post... and I like what I read! but I wanted to add one more car to this list which I think would be a hit amongst us Lyka builders. 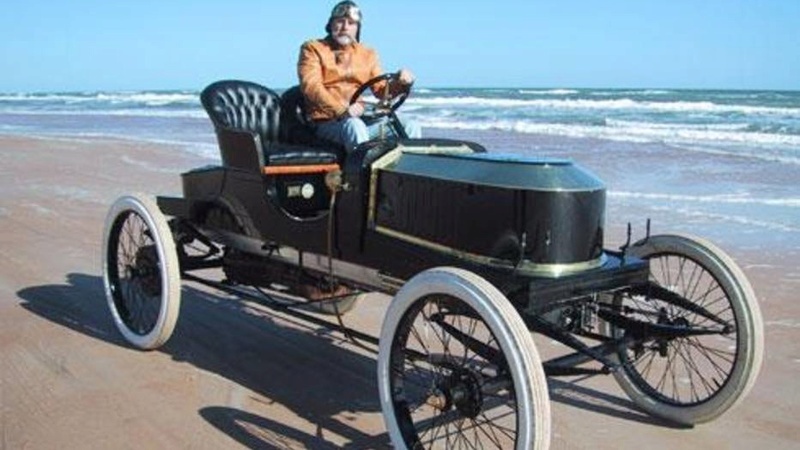 You see I became obsessed with the 15hp 1905 H (#5) that ran the Mt. Washington hill climb. It had tiller steering and I have managed to get 2 pictures of this car (Thanks to the Stanley museum) But as mentioned this is more a one off dream now. So now I have to look at what else can fit the bill and I dig a bit more into the really early coffin nose and the particular Stanley I am now thinking would be a great kit would be the Model G. The Model G is basically a coffin nose ridding on top of the C/CX chassis with a 10HP power plant. If the Lyka runs around 15K (GBP) then I would think this coffin nose might be twice that (? ), which to be honest if so... I would be the first to sign up for this kit... anyone else? Lets get at least 10 takers then it should peak Steve and Dean's interest! In conclusion I think this 'G kit' would be a great addition to the Lyka collector/builder. It will have a bit more HP giving us greater drivability, especially on tours, Hill climbs, it will have the coffin nose look, which I know a lot of us lust for, and it should be able to be registered (according to what Eric wrote in this post) on UK roads (with a 28MPH restriction, etc.) Here in the USA I don't believe we would have such a restriction. Dean or Steve if you are reading this what do you think? Can we talk prototype? 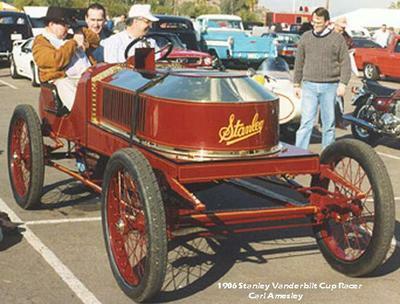 How about something more like the Model H Vanderbilt Cup Racer? Could essentially be a Lika laid out flat with the boiler still out at the front, tanks and burner behind that under the long bonnet, tanks and battery under the seats matched with a relatively simple body with no wings etc. Most difficult would be the bonnet profile! To keep it affordable, STW could offer the car in the most basic form with no lights/light brackets/horns etc and utilise a lot of the lika parts. The car in basic form could even come without dash and seats - leaving it up to the owner to pick and choose what style seats/type of dash they wanted to fit. For me this would actually be a benefit as it would be lovely to source old 'bits and bobs' and make the cars individual. Would be nice to know what Steve and Deans thoughts are on this? I realise they have looked into larger cars before and it has always been cost prohibitive but there must be a way. Re: How about a smaller Stanley as a followup to the Likamobile?